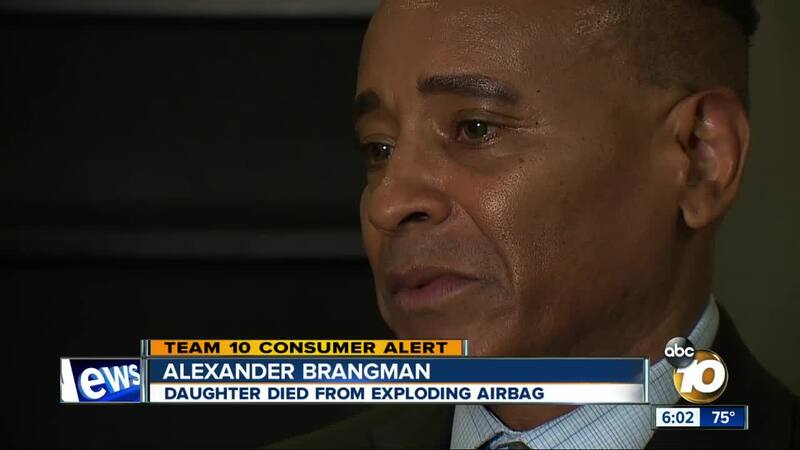 (KGTV) - A San Diego father who lost his daughter after she was hit by shrapnel from an exploding airbag spoke to Team 10 about the latest death connected to these faulty devices. The latest death occurred in June, according to a statement released by Honda, which made the car involved in the crash. The driver, Armando Vargas Ortega, was hit by shrapnel from the airbag when a 2002 Honda Civic crashed at an intersection, a Honda spokesman said. The death occurred a few days later. Alexander Brangman understands their pain. On Sept. 7, 2014, his daughter Jewel Brangman rear-ended a van in her rental car on a freeway in Los Angeles. Four vehicles were involved. Everyone walked away from the crash, except her. Alexander Brangman said shrapnel pierced her neck. She later died. WATCH the story to hear his reaction about this latest fatality and what he feels the government needs to do.